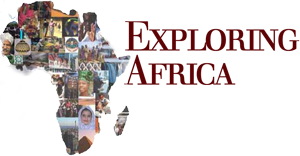 You have already learned about the difficulties geographers have in creating regions in Africa in Module 20, and in the introduction to Module Four: Examining Africa’s Historical and Global Connections. There, we discussed the early conceptions of two Africas—North/Arab Africa, and Sub-Saharan/Black Africa. In doing additional research on the region, you will likely find that North Africa and the Middle East are often combined, but separated from the rest of the African continent. This global clustering is based on many characteristics, including social and cultural similarities, geographic and climate similarities, and even historical movements of people, but was also a racial construction used in pre-colonial and colonial times to justify differing patters of interactions with indigenous populations. Throughout your study of the regions of Africa, you will come to understand these similarities and differences as well as the vital role of North Africa in the continent. In this lesson, however, our focus on the region begins with a brief overview of the similarities and differences between the countries within the region. Often, North Africa is divided further into sub-regions: the Maghrib, Arabic meaning “where the sun sets” (the western sub region that includes Morocco/Western Sahara, Algeria, and Tunisia) and the Mashriq meaning “where the sun rises” (the eastern sub region including Libya and Egypt), while at other times, Egypt and the Arab Middle Eastern countries are combined into the Mashriq while Libya and Mauritania are linked with the Maghrib. This continual mixing of regional names and meanings is one of the reasons that studying the area can be confusing. For our purposes, if we need to distinguish, we will use the Maghrib for the western North African nations of Morocco/Western Sahara, Algeria, and Tunisia, and Mashriq for Libya and Egypt, which also reflects the region’s colonial history as we’ll discuss in following activities. 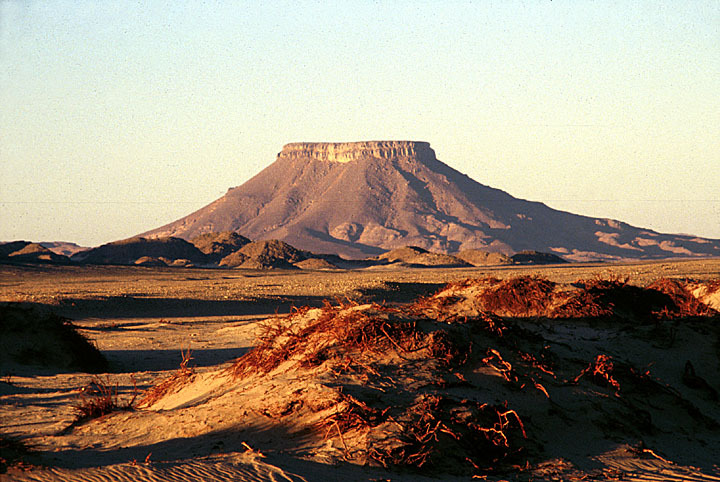 A number of movies have been filmed in the region, demonstrating its environmental and climatic diversity: Gladiator, Hidalgo, Black Hawk Down, The Mummy & The Mummy Returns, The Four Feathers, The Passion of Christ, The Jewel of the Nile, Kundun, Spies Like Us, Troy, The English Patient, The Life of Brian, Raiders of the Lost Ark, and Star Wars episodes, I, II, IV, & VI. Look at the above map in which we’ve shown the major waterways of Africa with climate zones. Notice that there are virtually no surface waterways throughout the region, with the notable exception of the Nile in Egypt. Where are the other water resources in the region? The fertile areas of the Mediterranean coastline are hydrated by their proximity to the sea. The Atlas Mountains stretch from the Atlantic coast of Morocco all the way to Tunisia, and form a high barrier that virtually wrings water from the clouds. This rain creates rivers and streams that run through the mountain villages and water the valley farms. The dominant feature of North Africa is the Sahara desert (since Sahara means desert in Arabic we will usually just call it the Sahara), which covers approximately 8.2 million square kilometers (approximately 3.3 million square miles) from the Atlantic on the west to the Red Sea (or the Nile delta) on the east, from the Atlas Mountain and the Mediterranean on the north to the 16th parallel on the south. The United States, including Alaska and Hawaii, is only slightly larger, at about 3.7 million square miles. 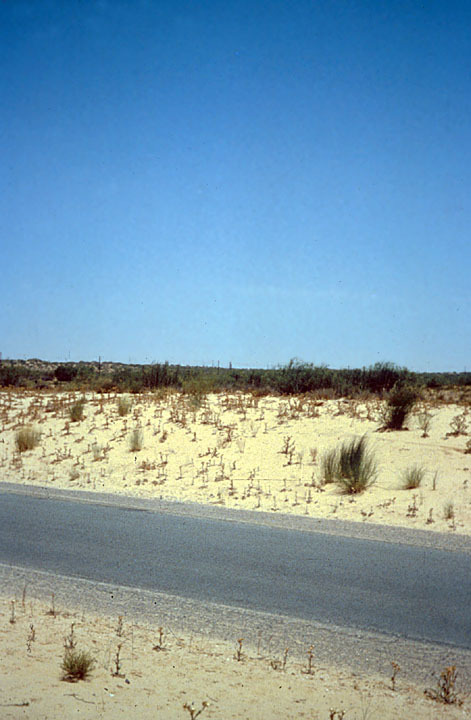 Temperatures in the desert regularly top 130 degrees Fahrenheit during the day and can fall below freezing at night. Rainfall is scarce, more common in the southern regions than the north, but when it does fall, it often causes flash floods. Worse, sand storms regularly whip through the desert, moving tons of sand around the continent. 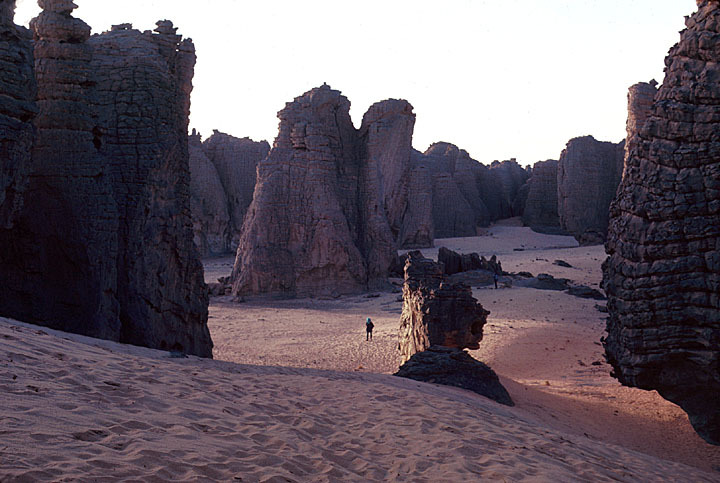 Algerian Desert © Africa Focus: University of Wisconsin. Libyan Desert Scrub © Africa Focus: University of Wisconsin. 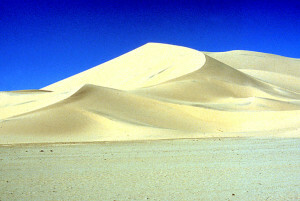 Algerian Dunes © Africa Focus: University of Wisconsin. Saharan Dunes in Southern Morocco © Africa Focus: University of Wisconsin. When we think of the Sahara, we usually picture tall mountains of shifting sand. These spectacular formations are called sand dunes and sometimes make massive sand seas, called ergs. However, the desert also contains regions of hard rock and clay steppes, gravel beds, and dry mountains. 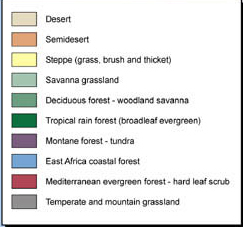 As we will see in this module, the Saharan climate influences not only what animals are found in the area but also which people live there and how they thrive in the tough environment. In addition to sand and rocks, however, the Sahara is also dotted with oases, small fertile pockets supplied with water from underground caches or mountain streams and aquifers that run into the desert. 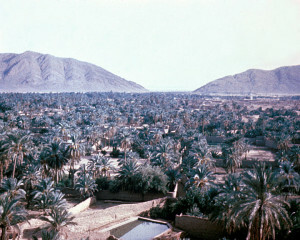 Oases often cultivate subsistence crops as well as dates and figs. They are also important water stops for desert travelers and herders. Oasis in Morocco © Africa Focus: University of Wisconsin. Berber Oases Farmers in Morocco© Africa Focus: University of Wisconsin. North Africa is bordered on the north by the Mediterranean Sea, and the climate of the coast is similar to that of the rest of the Mediterranean countries, including the coastal areas of Greece, Italy, Turkey, France, and Spain. 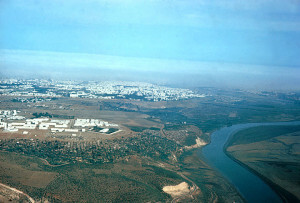 In North Africa, this region provides rare fertile valleys for many crops, especially citrus and olives but also irrigation for everything from tomatoes to eggplants to lettuce, and this range is extended inland in Morocco, Algeria and Tunisia due to the presence of the Atlas Mountains trapping the moist air. 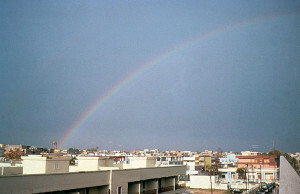 Rainbow over the Mediterranean Ocean in Libya © Africa Focus: University of Wisconsin. Moroccan River Wanders to the Sea © Africa Focus: University of Wisconsin. The Mediterranean region is known for dry, hot summers, and wet winters, though year-round sun makes it a prime tourist destination. The changing temperatures and moisture affect what grows in the area; wet winters encourage plant growth but only some plants can survive the hot summers. Since fires and summer droughts are common, and since rainfall can vary drastically from year to year, indigenous plants are drought resistant. 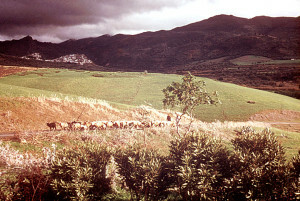 Tunisian Farm Field © Africa Focus: University of Wisconsin. 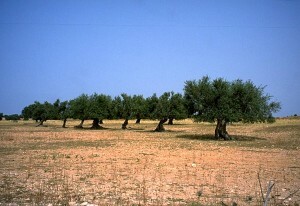 Olive Trees in Tunisia © Africa Focus: University of Wisconsin. 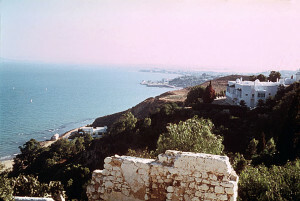 Tunisia’s Mediterranean Coast © Africa Focus: University of Wisconsin. The Atlas Mountains, reaching across the northwestern part of the continent from the Atlantic Ocean and Morocco to the Mediterranean and Tunisia, are of vital importance in the geography of North Africa and especially to the Maghrib. As we mentioned earlier, the Atlas Mountains are responsible for much of the fertile areas of the Maghrib as their height blocks humid air masses from the Atlantic and Mediterranean, trapping the moisture and creating precipitation (rainfall). This feeds aquifers and permanent streams and rivers in the mountains—which not only hydrate mountain communities and valleys, but also create important water sources for lowland irrigation. This constant water availability basically extends the coastal plains into the continent to the base of the mountains, greatly increasing the arable land available to these regions as well as increasing the diversity of crops that can be grown there. Of course, the high mountains also help create the Sahara as water is trapped north of the mountains, creating what is called a rain shadow—an area that cannot be accessed by humid air masses, and is consequently devoid of precipitation. 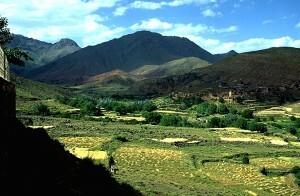 High Atlas Farming in Morocco © Africa Focus: University of Wisconsin. 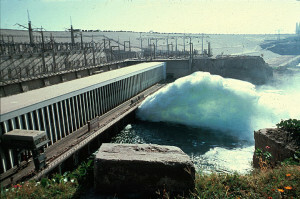 You may have heard of the Aswan Dam, a large dam in Egypt which controls the Nile River. Before this dam was built, the Nile flooded yearly, depositing the fertile soils carried from Ethiopia and Sudan across the Egyptian flood plain. Now that the flooding is controlled, the Nile irrigates farms all along the former flood plain. 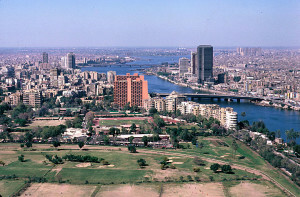 In Cairo, centuries of sedimentation has created a delta 22,000 square kilometers large (roughly the size of the state of Massachusetts). Both the flood plain and the delta are losing fertility as the mineral sediments usually carried and deposited by the Nile are building up behind the many dams constructed along the length of the river. 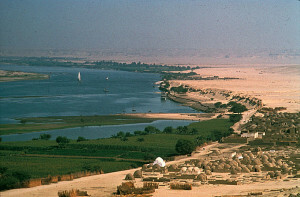 The Nile adds humidity to the Egyptian climate, but most of the country is still a desert. The delta provides much of the arable land of the country and there farmers grow corn, rice, wheat and many other subsistence and cash crops. This area provides much of the food for the country as well at its exports. 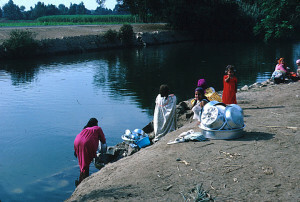 Women Washing in the Nile © Africa Focus: University of Wisconsin. 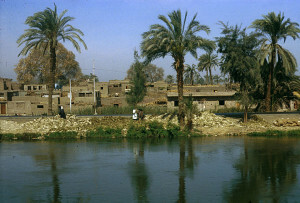 Nile Delta in Cairo © Africa Focus: University of Wisconsin. 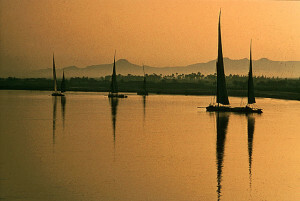 Sailing on the Nile © Africa Focus: University of Wisconsin. The Aswan Dam—One of the Largest in the World © Africa Focus: University of Wisconsin. Upper Nile Village © Africa Focus: University of Wisconsin. 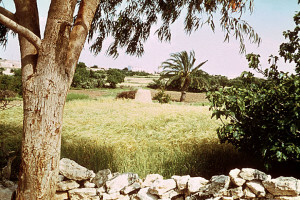 Growing seasons in North Africa vary depending on the region and climate. Tree crops, like olives, dates, figs, etc., grow year round, but harvest time is based on yearly growth cycles. In the mountains, most crops are sown before or after the spring rains, and harvest usually occurs in the early fall before temperatures turn cold and snow falls. In the irrigated lowlands and Mediterranean coasts, there can be two crops a year, usually planted with the fall rains and harvested in the early spring and again planted in the spring and harvested in late summer. The unique climate of North Africa supports a variety of indigenous wildlife species. These include mammals, like foxes and desert cats, reptiles, including desert monitors and horned vipers, as well as many bird and insect species. Some of these are described at http://www.pbs.org/wnet/africa/explore/sahara/sahara_animals_lo.html a special site about the Sahara desert. Many indigenous species are endangered, including the Monk Seal, which lives in the Mediterranean along Algeria’s coastline, the Barbary Deer in Morocco, Algeria and Tunisia, and the Nile Crocodile in Egypt. We don’t know much about what species were common before colonialism because there is little recorded on the subject from that time. However, when European naturalists became interested in North Africa in the late 1800s, they witnessed the extinction of a few interesting animals (these animals are described and recorded in Day, D. 1981. Doomsday Book of Animals: A Natural History of Vanished Species. New York: Viking). The Brown Atlas Bear disappeared due to habitat destruction in the Atlas Mountains of Morocco in the 1870s. The Bubal Hartebeest vanished from the Algerian Desert and Moroccan High Atlas Mountains due to hunting. The last Bubal Hartebeest was recorded having been killed in 1923. The Barbary Lion (also called the Atlas Lion) is perhaps the most famous extinct North African animal. The Roman Empire imported thousands of these fierce, beautiful animals, but the combination of intense hunting and habitat loss (as humans moved further into the Middle and High Atlas Mountains of Morocco) finally eradicated the Atlas Lion in 1922. Growing food to eat and to sell is the most common living system in North Africa. As you can see from the following chart, each North African country grows specific crops that fit their climate regions. These crops are both commercially farmed for export and family farmed for consumption. In mountainous regions crops are grown in terraces on steep slopes. The rock terraces hold what little soil is available and also trap rain and irrigated water around the crops. In lower elevations, large farms use tractors, sprinkler systems and other technology that looks similar to farms you’ve seen in Canada and the U.S.
Atlas Farmers Thresh Wheat © Africa Focus: University of Wisconsin. In areas where arable farmland is insufficient, many people either supplement their farming with herding, or depend on herding to make a living. They use complex systems of migration to move their flocks of sheep and goats (and sometimes camels and other animals) from pasture to pasture, taking advantage of different growing seasons in different areas. For instance, mountain herders will often move their herd from lower elevations in the winter to higher elevations in the summer, that way summer grasses become fodder for their animals while their winter pastures rejuvenate in the absence of the animals. 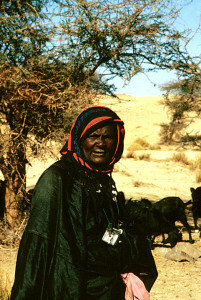 Desert herders follow seasonal courses as well, seeking water and food for their animals. 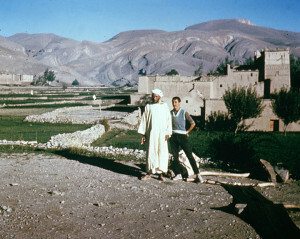 Sheep Herders in Morocco © Africa Focus: University of Wisconsin. Algerian Nomad Woman © Africa Focus: University of Wisconsin. A final way that people survive (and have survived) in North Africa is as nomads. Nomads are people who travel extensively, like herders, seeking the resources they need to survive. They may follow animal migrations for food and water, or become traders bringing products from one area to another, using their profits to buy food and other necessities in the towns they visit. Nomads were once very popular throughout North Africa, but in recent years many, if not most, have settled into agricultural or herding lifestyles. We’ll discuss this further in Activity Two. There are a number of environmental challenges facing the people and countries of North Africa. Like in other developing regions, North Africans face “rapid population growth, rampant urbanization, and poorly regulated industrialization” (Swearingen & Bencherifa, 1996). Perhaps the most significant challenge to the region’s environment is desertification, or increasing water shortages and resulting encroachment of the desert. Desertification is caused by both climatic changes and destructive land uses. The Sahara is the result of thousands of years of desertification —as the global climate changed since the last ice age, weather patterns altered and what had been, in pre-historic times, fertile grassland has become the ocean of sand we know today. Though global climate changes continue today, the current rapid rate of desertification is explained by human practices and pressures that use more water than can be replenished while destroying the environment’s ability to hold and use the water that does exist. 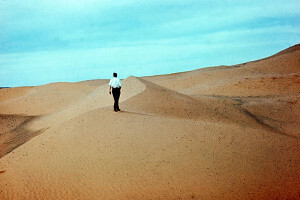 Desertification is caused by many human pressures. First, humans clear native plants from marginal land in order to grow crops to feed themselves. Before the new plants grow, the fields are vulnerable to erosion —wind and rain carry away the loose topsoil. Additionally, non-native food crops, like wheat and corn, use up the nutrients in the soil and do not replace them. Since most farmers can’t afford to buy fertilizer, they are forced to move to even more marginal land to attempt to feed themselves. The overused plots are so eroded by this point that native plants cannot grow either and the area becomes infertile desert. 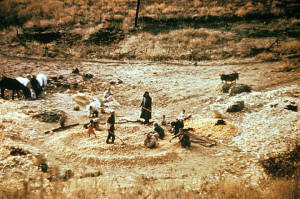 Desertification is also caused by other human activities, like overgrazing—when herders are forced to graze their animals until they have eaten all the vegetation. Urbanization also causes desertification—as large cities expand, they use more underground water sources and lower the water table. 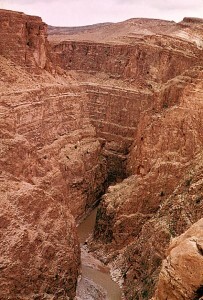 A shrinking water table means less water rises to the level of plant roots and few plants can access the deep water, so the plants die and the area becomes desert. Finally, humans are causing global climate changes that produce desertification, just like those that produced the Sahara over millennia. However, manmade global change, like global warming and other pollution problems, are causing much more rapid desertification than happens naturally and that means that plants, animals, and people have less time to adapt to the new environment or to find one in which they can survive. 1) Now that you have seen the geographic contours of this region, what do you think of the international tendency to group this region with the Middle East rather than with the rest of Africa? Pair up with another student and write “letters to the editor” in which you debate whether North Africa is Middle Eastern or African and why. Respond to the arguments of your partner in a “follow up” letter. http://www.sciencedaily.com/releases/1999/07/990712080500.htm. Now, locate two more articles about the causes of desertification at http://www.fao.org/desertification/default.asp?lang=en. Create a short (5-10) minute presentation for the class in which your group discusses the causes of contemporary desertification in North Africa. Come up with a creative way, not suggested on these sites (an original idea), in which we can help North Africans combat desertification—either something we can do or something they can do. Tell us why this solution will help and especially consider what resources the average North African or North American will need in order to implement your idea. **Note: If you do not have access to the internet, you can research more information at your school’s library. Many world atlases will contain this type of information, as will a variety of environmental books, including Hillstrom, K & Hillstrom L.C. Eds. 2003. Africa and the Middle East: A Continental Overview of Environmental Issues. In the World’s Environments Series. Santa Barbara, CA: ABC-CLIO, Inc.
Offers excellent geographic information on every nation in the world. The United Nations Global Environment Outlook offers an excellent site on environmental issues around the world. Information on environments in Africa with specific topics related to water, climate, and ecosystems.